We've always been head over heels for rainbows! 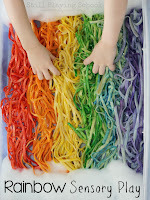 This invitation to build a pipe cleaner rainbow allows children to review colors and practice fine motor skills at the same time. 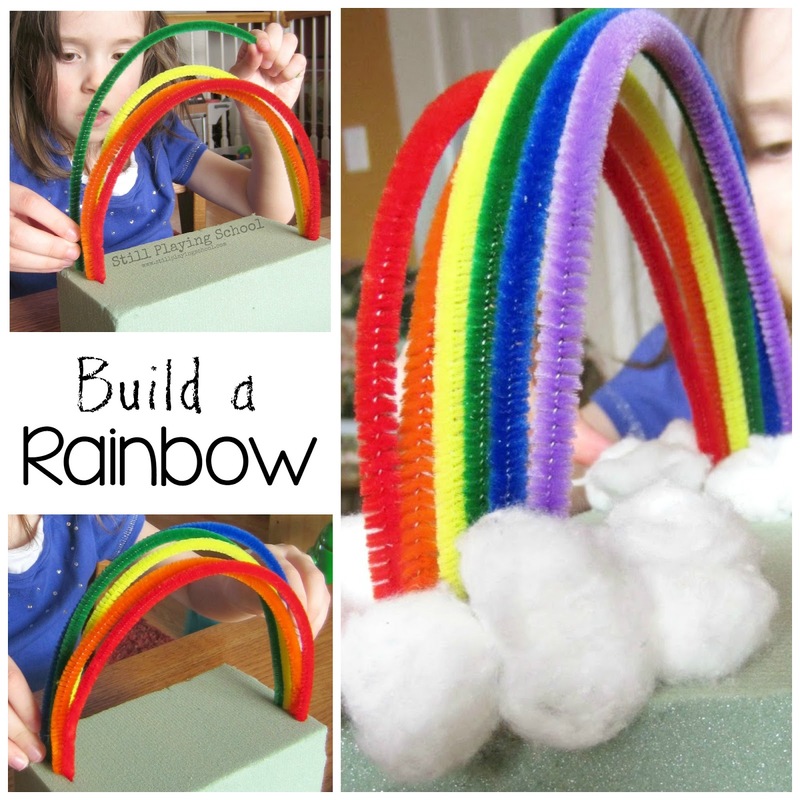 This quiet time activity doesn't use glue so kids can create their rainbow again and again. 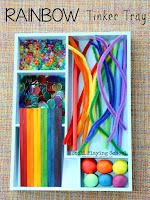 What makes this rainbow building challenge unique is the material we use for our base. Don't worry, we'll share links to all the materials at the end of our directions, but first we want to show you the fun! Invite children to put the pipe cleaners in rainbow order. "Red, orange, yellow, what comes next? Can you find a green one in the bag?" The pipe cleaners can be pushed directly into the base. If you prefer, you can have an adult position the holes first. 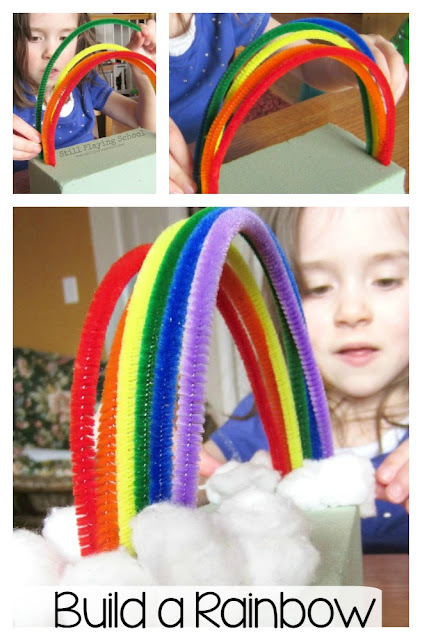 Kids push the pipe cleaners in firmly then wrap the other side over to make the arc. Once the rainbow is complete add cotton ball clouds. They stick directly to the rough surface naturally so no glue is needed! You could always glue your materials if you wanted the project to be a keepsake craft. 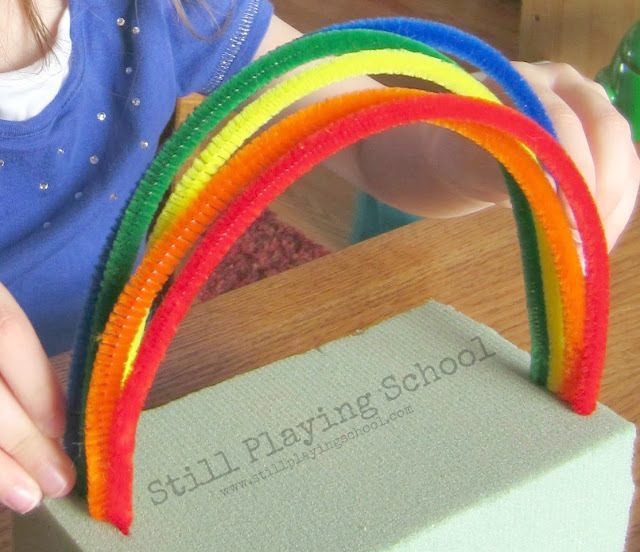 We liked that we could rebuild the rainbow over and over again. This would be perfect for a preschool classroom center because lots of children could participate. 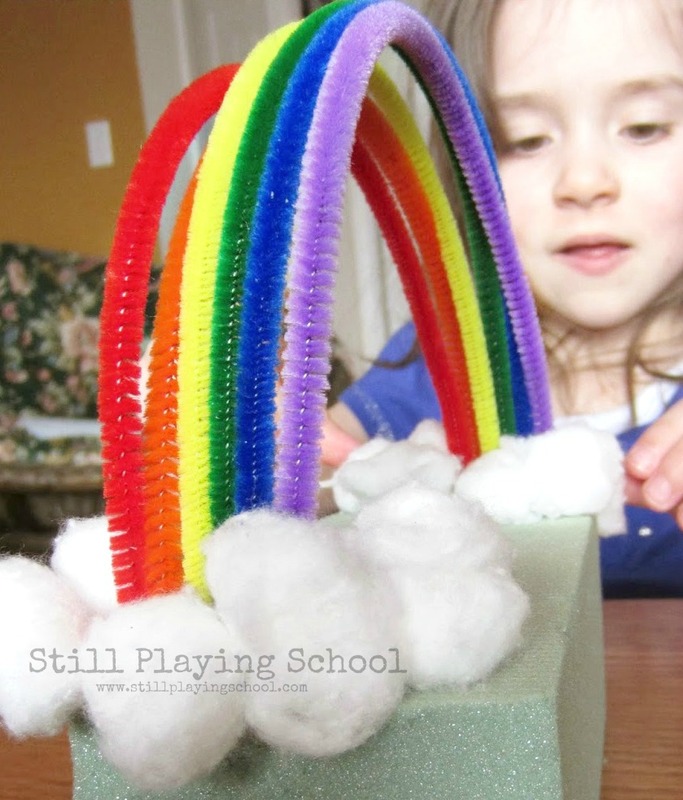 All you need for this project is rainbow pipe cleaners, cotton balls, and floral foam! We even found the foam at our local dollar store. 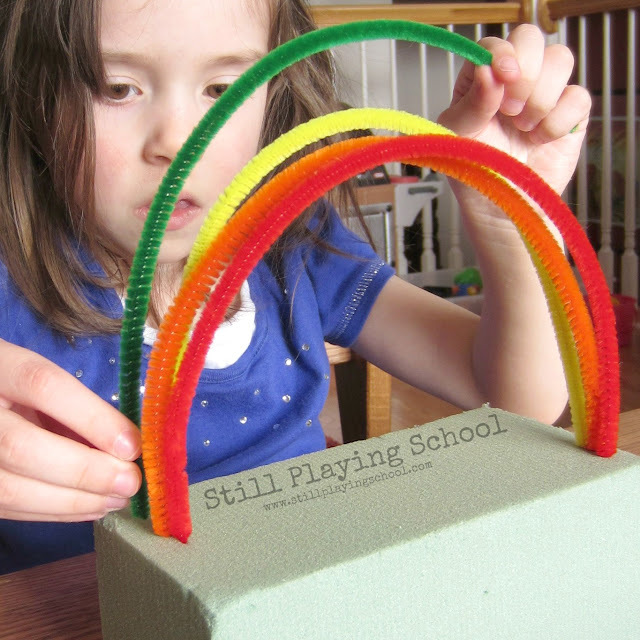 Rainbows sure to brighten up a room! 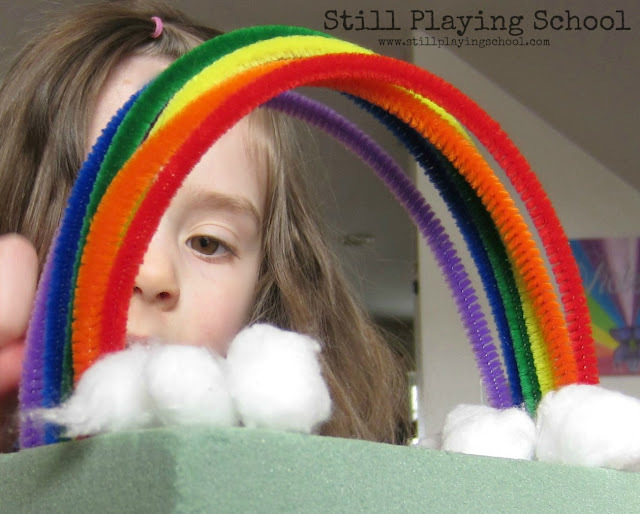 We used our rainbow as the setting for small world play for lots of magical creatures. Maybe you can use yours to trap a leprechaun? E is so freaking cute!! Great idea too!! As an aside, I spent a few hours last night reading the stories in your Trisomy 13 series. Thank you for sharing them so that we can remember and celebrate these beautiful children and their amazing parents. 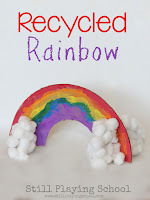 I just loved your kids' sculptures, Jamie, and your blog! Thank you for stopping by and for your sweet words about Violet and the other Trisomy 13 babies! 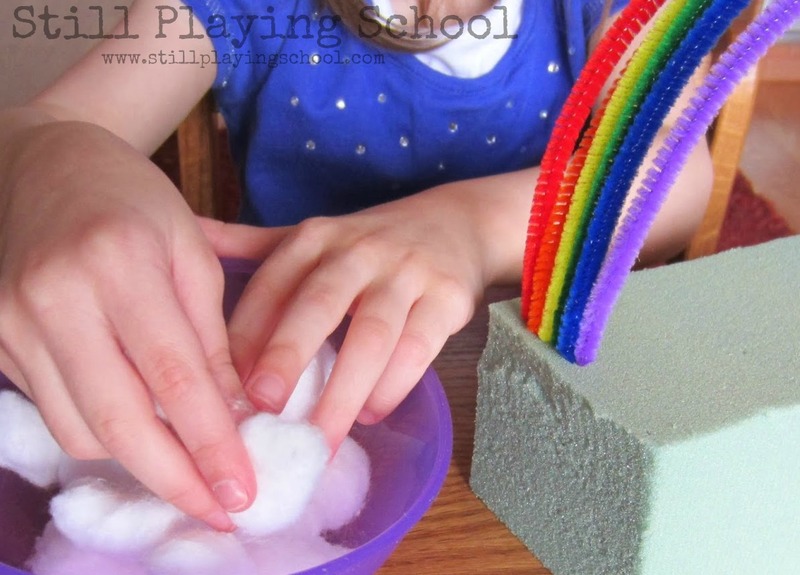 Hi, I absolutely love how you have recreated this idea with the foam. 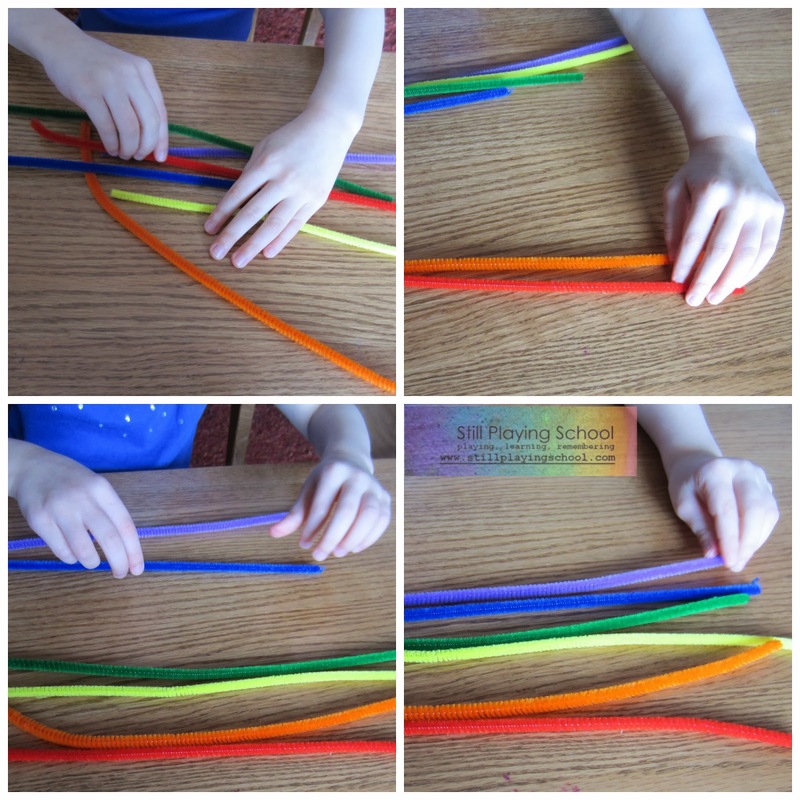 It is very similar to a post I wrote but we used play dough for the pipe cleaners. I only just discovered your blog today and look forward to taking a look around at all your amazing ideas. Thanks for your sweet comments! I'll have to take a look at your version as well and check out your blog! I love finding new blogs to follow!